She dressed in a white suit pants by designer Ralph Lauren and color which also elected Hillary Clinton for his speech of acceptance of the Democratic nomination as a tribute to the suffragists, the former Slovenian model Melania Trump held discreetly in the background among the five sons of President – elect during the victory speech. The future first lady was very close to her husband Donald Trump, but left the central foci for Barron, the 10 year old son of the couple. That will be the family that expected moves into the White House in January. 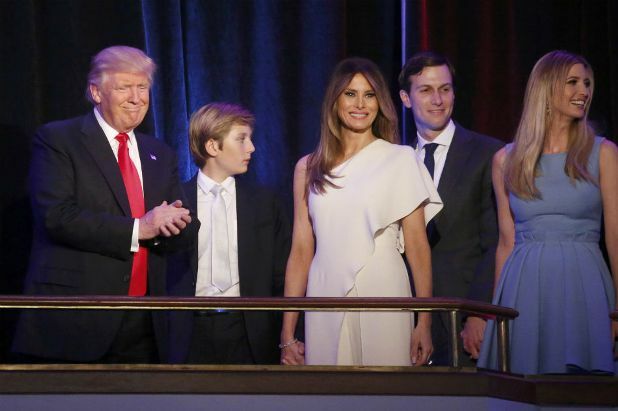 The other four children of tycoon – the two previous marriages of Trump – already fly alone. Melania Knauss (her maiden name) was born 46 years ago in the city of Sevnica (Slovenia), while it was still in communist of Yugoslavia integrated presiding Marshal Tito. There she made her first modeling jobs at the end of the 80’s until she moved to Ljubljana, where she enrolled at the University of Architecture and Design, career that did not complete. After a while working as a model in several European cities, Melania decided to make a career in New York, a city to which she moved in 1996. That date has not been free of controversy, since in the last week of the campaign the AP agency published information that pointed to the former model would have worked before in the US without the necessary work permit. The former model, who also tried her luck as an entrepreneur but with little luck, will become the first FLOTUS – as it is known to the first lady – who has posed naked for the cover of a magazine. Also it will stay in the annals of the history like the second tenant of the White House who has not been born in the USA. The first was Adam Louisa, British wife of President Quincy Adams, who ruled between 1825 and 1829. After several months away from the spotlight – after come to light that part of her speech at the Republican National Convention she had been plagiarized from another Michelle Obama – Melania returned to exercise of consort publicly in the last week of the campaign. The future first lady returned to the stage to introduce her husband or ask for a vote for him. Also identified some of the issues that, if he came to the White House, she was going to fight. Among them, the ‘cyberbullying’ against children and adolescents. A topic for which she was criticized, considering the attitude of her husband with the women and with rivals. Melania was presented at the event in Pennsylvania as an immigrant who has achieved the American dream. “Living and working in the US was a real blessing, but I wanted something more”. A status achieved in 2006, after marrying Trump in 2005. Since her husband presented his candidacy for president in June 2015, Melania has been the target of much criticism for her past. Several publications echoed that she had worked as “lady of company” before marrying the businessman. The future first lady did not hesitate to put in the hands of his lawyer this matter. In fact, she sued the British newspaper ‘Daily Mail’ and ‘Webster Tarpley’ for defamation. Who is Princess Eugenia’s fiance?